The free Value of Financial Flexibility model estimates the value of financial flexibility. For example, the maintenance of excess debt capacity or back-up financing that your business has as an option. You can take advantage of this free template today by using the calculator to see an overview of the reinvestment you need to make in order to make in accordance with the form value of your investment. If you’re ready to give this free template a try, simply read the documentation provided below to learn how to download and use this template for your own needs. To download the free Value of Financial Flexibility, follow the link that we have conveniently provided at the bottom of this page. The template can be broken down into 2 simple steps. 1. Enter details under the input section in the “value of flexibility” sheet. 2. Under the “reinvestment needs” sheet; enter details in the 1st 3 column 3. If you want to follow these instructions step-by-step, the first things you need to do is enter the number of years you plan on making your reinvestments in the first column of the main table. After, simply enter the reinvestment and firm value in the next two columns. The template will take the information you have provided, along with the standard deviation percentage to give you the reinvestment needs as percentages of the firm value and the value in what you have invested in already. 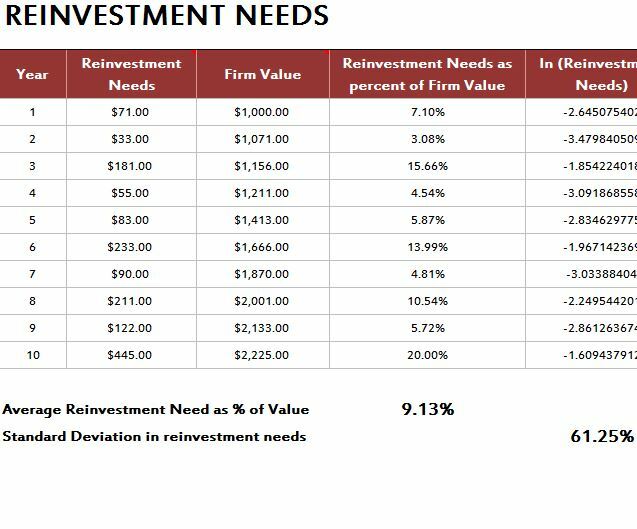 In the sections below the table, you can see the average reinvestment needs value and the standard deviation percentage being used for the formula. If you want to print the document to keep for your records afterward, just click “File” then “Print” above. This template provides you with a new and exciting way to keep track of your reinvestment needs.